Jimmie's Chicken Shack is an american alternative rock group. They emerged through MTV airplay during the final days of the alternative era. They formed in Annapolis, Maryland, United States in 1994 and are best known for their 1999 alternative radio hit "Do Right". Jimmie's Chicken Shack has always produced an indie grunge/funk/jazz/ska sound similar: Incubus, Red Hot Chili Peppers, Sublime, etc. Jimmie's Chicken Shack has always produced an indie grunge/funk/jazz/ska sound similar: Incubus, Red Hot Chili Peppers, Sublime, etc. Mainstream popularity has fallen for Jimmie's Chicken Shack after a brief peak thanks to heavy MTV support for Do Right. After an extended hiatus, JCS reformed w/ a slightly modified lineup, maintaining a substantial fan following. Released four studio albums; Pushing the Salmanilla Envelope (1997), Bring Your Own Stereo (1999), Re.Present (2004) and Fail On Cue (2008). 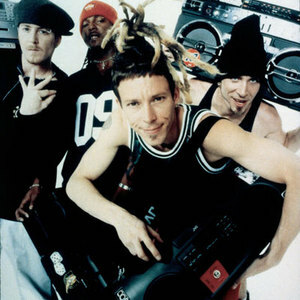 Prominent singles include "High" and "Dropping Anchor" (both from Pushing...), "Do Right" (from Bring Your Own Stereo), and "Falling Out" (featuring Aaron Lewis of Staind) (from Re.present). A fourth studio album, Fail On Cue, was released in January 2008.